featuring my paintings of favorite animals, is available now. This is a hardcover book both children and adults will enjoy because it is a colorful read for children and, also, a fun coffee table book for those with a special love of animals. Old Pompey, the last alligator that lived in the lobby of the Jefferson Hotel is featured in the beginning of my book. 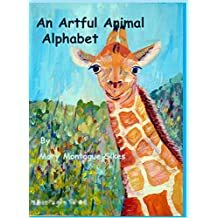 Saturday, December 16 12 noon to 4 p.m., I will be signing copies of An Artful Animal Alphabet at the New Town Barnes & Noble in Williamsburg, Virginia. My invitational painting show of watercolors on Yupo and canvas continues until December 29 in the Nook Gallery at RAL Art Center in Kilmarnock. I was honored to judge their 56thannual Labor Day show this year. My little date book was full for the month of November. Lots of exciting plans spread out over the pages--book signings, art openings, a radio appearance. I looked forward to so many events to promote my new children's book, An Artful Animal Alphabet. Then along came Guillain-Barre Syndrome out of nowhere. Olen awakened on October 30, 2017 unable to move out of the reclining chair where he had fallen asleep at 6 a.m. He was paralyzed. A friend came to help and couldn't move him. We called the rescue squad. They all suspected a stroke. All my plans changed. The month disappeared from my calendar. I slept in a chair in his hospital room; so did one of our daughters. The medical teams did not know what he had, much less what caused it. The MRIs--first, two of them at Riverside Doctors Hospital in Williamsburg, then the big one at Riverside Regional in Newport News--showed nothing, but it was not a stroke. Then Dr. John Livingstone decided it could be Guillain-Barre Syndrome and started him on a five-day IV treatment. That specially formulated drug and the oh so many prayers worked a miracle. I watched him practice raising his arms and legs all through the night of the second day of treatment. It was amazing. He went from not being able to feed himself to getting almost normal movement of his arms and hands overnight. I don't think I had ever heard of Guillain-Barre syndrome before. This rare disorder causes the body's immune system to attack its nerves. Usually the first symptoms are "weakness and tingling in your extremities." The symptoms spread quickly and paralyze the entire body. The cause is unknown, but sometimes it is traced back to a respiratory illness or stomach flu. My husband had neither. I've read that someone got it after a senior flu shot. My husband was told to never get another shot--flu, shingles, pneumonia, etc. I also read about cases they believe can be traced back to under-cooked poultry including rotisserie chicken. I don't plan to buy those chickens again at the grocery store. My husband is fortunate. He spent only one week in intensive rehab and came home walking without the aid of a cane or a walker. I spent the rehab week on a small bed in his room. Guillain-Barre changed everything. I am playing catch-up in a big way while Olen works to regain his strength. I was thrilled that he was strong enough on December 1 to drive at night across the long bridge over the Rappahannock River for the opening of my art show at the RAL Art Gallery in Kilmarnock. Have a wonderful Holiday Season. Cherish every moment.